Electrotherapy, also known as Interferential Current (IFC), is a form of electrical stimulation. 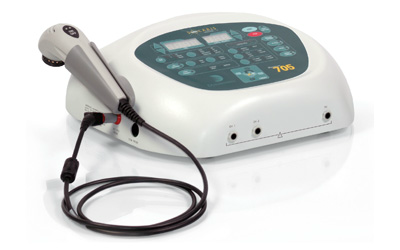 Electrotherapy in the form of IFC is characterized by the crossing of two electrical currents of various frequencies. These electrical currents work together to stimulate nerve fibers. These frequencies ease the transmission of pain messages from the spinal cord to the brain. Interferential therapy is a very comfortable treatment and is excellent at stimulating deep tissue, reducing pain and increasing blood flow. Electrotherapy treats pain and helps to accelerate the process of soft-tissue healing. Sticky pads are placed on the skin near the area of pain. When the machine is turned on and the intensity is slowly increased, electrical impulses make the patient feel a ‘pins and needles’ sensation. This level of electrical stimulation promotes the body to secrete hormones called endorphins. Endorphins are the body’s natural pain-killers. How does IFC differ from TENS? Interferential Stimulation differs from TENS (which are both types of electrotherapy) because it allows a deeper penetration of the tissue with more comfort (compliance) and increased circulation. Interferential current is a deeper form of electrical stimulation. Yes, interferential current (IFC) as well as other forms of electrical stimulation (TENS) are safe. Are there any contraindications to using Electrotherapy? Individuals with a pacemaker or patients who are pregnant should not use an Interferential device. Be advise your health practitioner is you have a pacemaker or if you are pregnant.